Sports Illustrated has been at the forefront of LGBT sports and athletics, simply by doing what they do best; publishing articles featuring sports, events and athletes. During the 1980s and early 1990s Sports Illustrated featured many LGBT athletes just as it did featuring many other athletes and events within it’s publication. Without bias or any kind of homophobic/ transphobic sentiment too often found during that time, Sports Illustrated offered a place for the few openly LGBT athletes to share their stories as they happened. Including many of the athletes previously featured here such as Renee Richards, Billie Jean King, Magic Johnson. The magazine drew considerable attention when it featured an article, in essence an obituary, on Dr. Tom Waddell on July 27th, 1987. 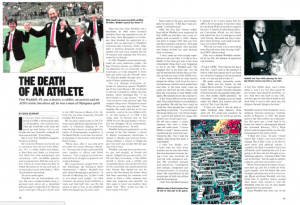 Titled “The Death of an Athlete” which despite the title went into detail about Waddell’s life as an athlete, a professional, a father and the founder of the Gay Games. The article did not attempt to hide or minimize Waddell’s homosexuality but simply included it as apart of his story like any other aspect of his life. It also talked about his fight with HIV/AIDS and ultimately his passing away shortly before the article was published. The reception of the article was mixed among positive responses from heterosexual and LGBT+ readers to the expected negative responses which had no impact on Sports Illustrated approach to featuring LGBT+ athletes in their magazine. Sports Illustrated did not shy away from talking about the HIV/AIDS crisis either as it affected athletes during a period when it was still relatively ignored and considered a “gay cancer”. in 1991 Sports Illustrated published an interview with Magic Johnson and his experience having recently been diagnosed with HIV. Through this interview and other articles published helped Johnson build awareness and education about HIV/AIDS among the main stream during a time when the fear of the disease was still very high. In 2013 Sports Illustrated again drew considerable attention when it published a picture of 2 men kissing at a San Francisco gay bar during a celebration of the 49ers winning the Super Bowl. 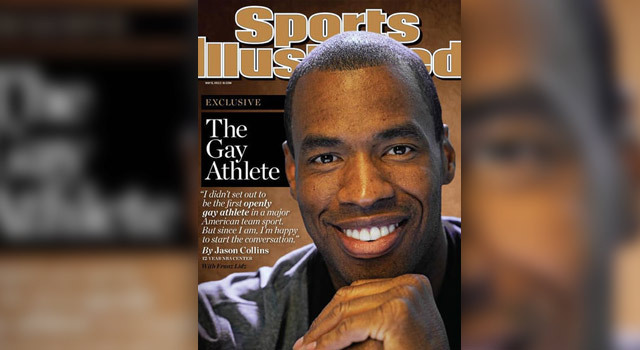 It was also one of the first publications to feature both Jason Collins and Michael Sam coming out stories. As more athletes come out in professional sport Sports Illustrated continues to feature the diverse community of athletes and events that take place, profiling their accomplishments in sport and how each individual’s story has impacted their teams, sports and community in general.